Caudalie Organic Herbal Tea is the third stage in the Caudalie Slimming Regimen that excelerates the elimination of toxins and excess water. Caudalie Organic Herbal Tea is created for all who wish to quench their thirst with a delicious fruity tea with figure-friendly properties. 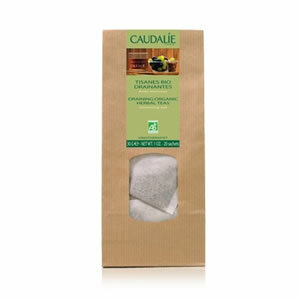 Caudalie Organic Herbal Tea contains a delicious blend of 5, 100% organic plants. These teas were created exclusively for the Tea Rooms of the Vinotherapie Spas and accelerate the elimination of toxins for an immediate sensation of well-being and lightness.